We are pleased to announce that Power Marketing Research has been certified a WBE (Women's Business Enterprise) and a WOSB (Woman Owned Small Business). In order to have WBE certification, a business must be 51% or more woman-owned, controlled, operated and managed. To become certified as a WBE, a business goes through a rigorous evaluation process that includes an in-depth review and a site visit. Certification is performed by a third party, such as the Great Lakes Women’s Business Council. 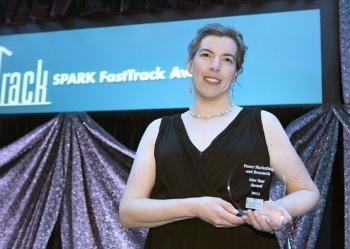 Power Marketing Research was recently honored with a FastTrack Award from Ann Arbor SPARK. This prestigious award is given to companies headquartered in Washtenaw County that demonstrate fast growth. We also won the award in 2011. A special thank you to all of our clients, colleagues, and partners that helped make it possible for us to continue to grow.